She's going on six years now with Dior and Marion Cotillard shows no signs of slowing down as face of the brand. Her latest ads for Lady Dior are anything but dull. Shot by Tim Walker, Cotillard shows off a new colourful side of Dior. As you'll see from these first images, the look and feel this season is one full of risks we're sure will pay off. 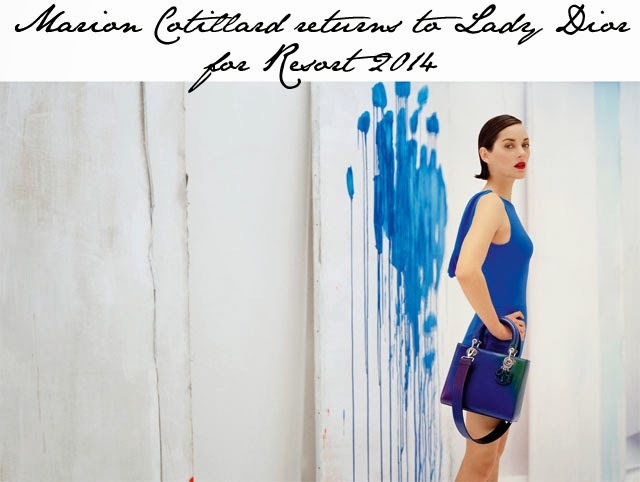 Resort 2014 has an artistic feel from the walls surrounding the set to the makeup used for Marion Cotillard on the shoot itself. A question for you all... How's everyone feeling about Dior embracing an Ombre style with colour this season on the handbags?